← VFP Awarded 2016 Peace Prize! 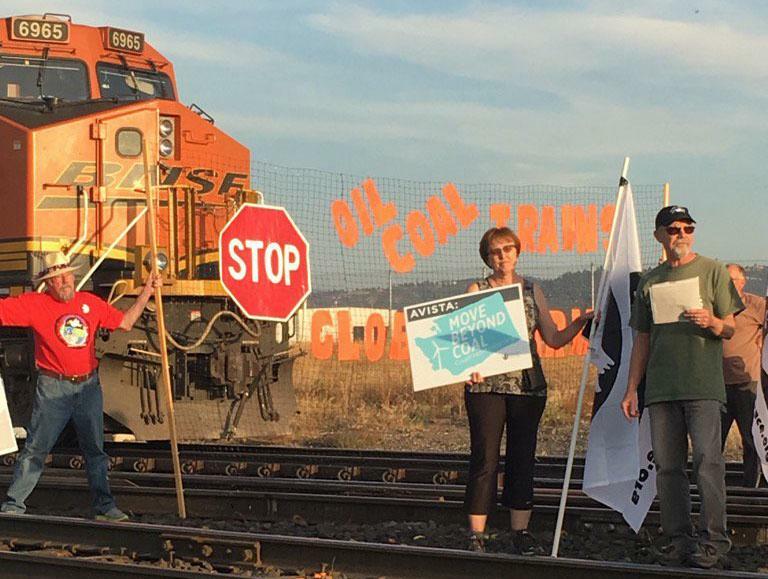 THURSDAY, SEPT. 29, 2016, 7:23 P.M.
Three people were arrested Thursday evening in a protest against oil and coal trains that shut down the Burlington Northern Santa Fe railroad tracks near Trent Avenue and Napa Street. This protest, organized by Veterans for Peace, is the second in Spokane in the last month. The first was organized by the Raging Grannies and also saw three people arrested. The stopped train visible on the tracks was pulling a large number of what appeared to be oil tanker cars. BNSF spokesman Gus Melonas said he would not confirm what the train was carrying. Three trains were halted by the protest, he said. A BNSF police officer warned the crowd to disperse and most of them did. The three remaining – Taylor, activist Rusty Nelson and Maevea Aeolus – were arrested and face charges of trespassing and blocking a train. Nancy Nelson, who was arrested and charged after the first protest last month, said her husband Rusty was arrested because things like speaking out at council meetings, signing petitions and writing letters wasn’t working. Melonas said people are welcome to speak their mind about oil trains, but the company asks that people not block the train tracks. “It’s extremely dangerous as well as disruptive,” he said.